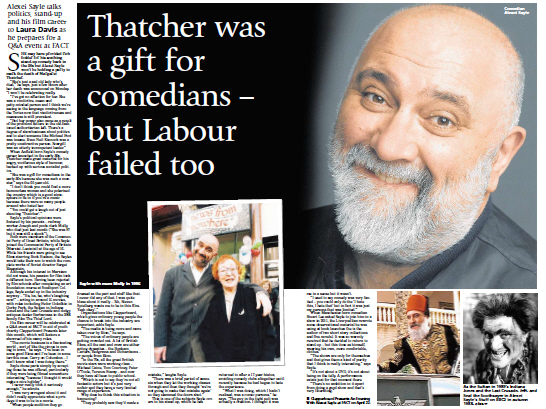 SHE may have provided rich fodder for his scathing stand-up comedy back in the 80s but Alexei Sayle won’t be holding a party to mark the death of Margaret Thatcher. “She’s just a sad old lady who’s died,” he says, just a few hours after her death was announced on Monday. “I won’t be celebrating really. “I’ve got no affection for her. She was a vindictive, mean and petty-minded person and I think we’re seeing in the language coming from the Tories now that vindictiveness and meanness is still prevalent. When Anfield-born Sayle’s comedy career launched in the early-80s, Thatcher made great material for his angry, vociferous style of humour, backed up with serious socialist politics. “She was a gift for comedians in the early-80s because she was such a monster,” says the 60-year-old. “I don’t think you could find a more humourless woman and she polarised the country which is a good atmosphere to be in if you’re a comic because there were so many people around who hated her. Sayle’s political opinions were fostered by his parents – railway worker Joseph and pools clerk Molly, who died just last month (“She was 97 but it was still a shock”). Both were members of the Communist Party of Great Britain, while Sayle joined the Communist Party of Britain (Marxist–Leninist) at the age of 16. While his friends were going to see films starring Rock Hudson, the Sayles would take their son to watch the complete works of Soviet director Sergei Eisenstein. Although his interest in Marxism did not wane, his passion for film took a different turn. Having been rejected by film schools after completing an art foundation course at Southport College, Sayle ended up in the industry anyway – “Ha, ha, ha, who’s laughing now!” – acting in around 15 movies, with roles including Fedor Golodkin in Gorky Park, the Sultan in Indiana Jones and the Last Crusade and dodgy antiques dealer Barbarossa in the 2006 family film The Thief Lord. His film career will be celebrated at a Q&A event at FACT in aid of youth charity Clapperboard Presents later this month, which will feature a showreel of his many roles. Sayle chose parts simply by accepting those he was offered, particularly if they were being filmed somewhere interesting “because I thought it would make a nice holiday”. “I never really took it seriously enough,” he admits. “I was very arrogant about it and didn’t really appreciate what a privilege it was to be in a movie. Organisations like Clapperboard, which gives ordinary young people the chance to break into the industry, are important, adds Sayle. “The media is being more and more taken over by Eton,” he says. “The voices of ordinary people are getting crowded out. A lot of British films, all the cast and crew are either acting dynasties – the Bonham Carters, Redgraves and Richardsons – or people from Eton. “In the 70s, all the great British movie stars were working class – Michael Caine, Tom Courtney, Peter O’Toole, Terence Stamp – and now they have all been to public school. Why does he think this situation is happening? “They probably saw they’d made a mistake,” laughs Sayle. This is one of the subjects Sayle covers in his stand-up, which he has returned to after a 17-year hiatus, avoiding comedy clubs altogether until recently because he had begun to hate the experience. “What I was doing, which I hadn’t realised, was a comic persona,” he says. “The guy in the tight suit was actually a creation. I thought it was me in a sense but it wasn’t. When Manchester-born comedian Stuart Lee asked Sayle to join him in a show in 2011, the Liverpudlian rewrote some observational material he was using at book launches (he is the author of two short story collections and five novels). It was so warmly received that he decided to return to stand-up – but this time as himself, wearing his own, more comfortable, clothes. “The shows are only for themselves and that gives them a kind of purity that I think is really interesting,” says Sayle. “It’s not about a DVD, it’s not about being on the telly. A performance exists just for that moment there.